So, October is right around the corner and naturally I began to get nostalgic about the good ol' elementary school days of trading candy in school buses and telling ghost stories. We used to have a few things major locations we talked a whole lot about, and that was either the haunted tower where the one "weird old guy" lived in cocoa beach, and the "haunted insane asylum" that apparently some kids would always sneak out to see at night. Later, in middle school, I finally learned exactly where this infamous insane asylum was. If you're from around Brevard, you might know that what I'm talking about is the long abandoned Universal Healing Center and Chapel near Mila Elementary. Now days, not much is known about the area besides the fact that it was a hangout spot for edgy activity and firefighters occaissionally did training sessions on the grounds. A few years ago, the healing center was finally demolished all the way to it's foundations, If you try visiting the location today, you will find an overgrown trail leading to a few concrete patches covered in palmettos and creeper vines. Tall tales of satanic rituals, demonic activity, and spirits of insane inpatients were excitedly shared amongst each other come fall time, but Like most legends coming out of the mouths of school children, most of the stories that were told about the place were fabricated. But those stories had to be based in some sort of truth. And Sometimes, truth is stranger than fiction. Thinking about it got me researching, and once I dug deeper things started getting more interesting. The Universal Healing Center was no mental asylum, but instead a religious order and school. One led by a reverend Marnie Koski (i'll touch on her a bit later). the only thing that was left that could reference that this place was once linked to religion, a 70 foot oxidized metal cross, sat perched near the dilapidated structures. This was no usual church though, that cross was instead a beacon for believers in another realm, one where the dead could pass through to communicate with the living. At one point the center had offered classes to more than 10,000 students. On topics such as numerology, auras, ESP, reincarnation, and astrology, with the overarching goal of expanding their sixth sense. Students could be ordained as ministers at the chapel after 7 years of interning and deaconship. Marnie Koski was the creator and head minister of a new religion, titled the Universal Religion of America, esatablished in 1963. Koski was referred to by members of the church as Soraya or "Solar Ray" and proclaimed to have "special gifts for healing and prophecy" and a messenger of god himself. 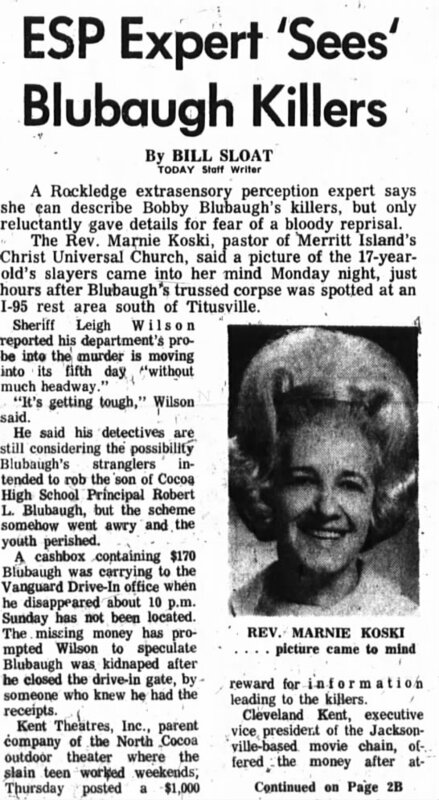 She once told a newspaper in 1980 that "The Lord sent her to Merritt Island (specifically) because of a need for greater expansion of the mind". The church services often included members speaking in tongues and calling out individuals to give them direct messages from the other side. The Center solely depended on what they called "love offerings" for upkeep. Hah. so turns out I didn't update anything. oops, oh well. Schools back up again, need to start applying for universities and picking only ONE idea to pitch to research. which is... difficult. Over the summer I did quite the amount of research. I also implanted a magnet in my hand (thanks cassox!). I'm beta testing a new implant coating. So far so good, and i'm pretty sure this implant broke a few records. Youngest kid with a magnetic implant goes to me for the time being I suppose :D.
Hello fellow cybernauts. Welcome to a new addition to my web. I want to have a place to talk some more, so here it is. School is over for now finally so that's a thing. No more long gaps between updates and naked pages for me (Hopefully soon!). Music may become prevalent among these pages, and you might be seeing some biohacking projects here. I'm going to post some more stuff within the week.